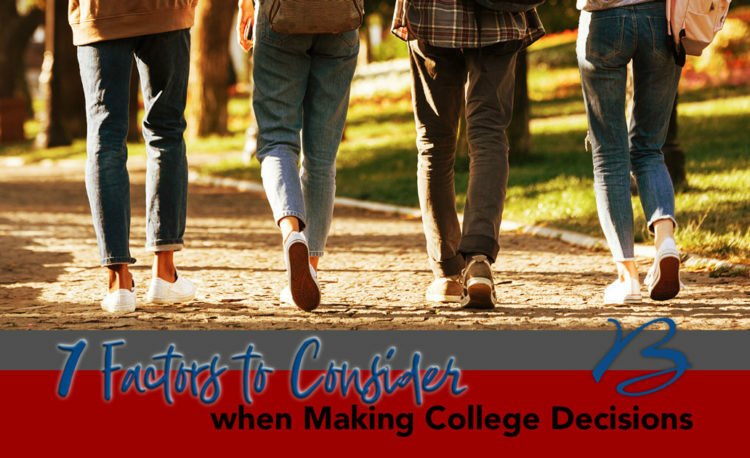 7 Factors to Consider when Making College Decisions | Back to Basics Learning Dynamics, Inc. This list is a helpful organizational tool. Make objective and honest lists regarding each of these factors. And consider one more: size of the college. If strong relationships with faculty members are important, seniors might want to think carefully about the school’s enrollment. Large schools don’t always equate with meaningful connections. A recent Gallup survey found that 45% of students at colleges and universities with fewer than 5,000 students — which often have lower student-to-faculty ratios — strongly agree that professors care about them as people, compared with 24% among those at institutions with 5,000 students or more. Students at schools with enrollment below 5,000 students were also more likely to have had an internship or job that allowed them to apply what they have learned, and more likely to say they are active in extracurricular activities and organizations. Large colleges and universities may offer a wide variety of majors, busy calendars of athletic events, and perhaps more prestige. For some students and families, those factors are important. Yet it’s just as important to objectively consider individual strengths and needs when choosing the next chapter. Back to Basics wants to help college-bound students in the class of 2020 get an early start with those big decisions. Check out our College Admissions Boot Camp and our SAT Boot Camp to help you put your best foot forward.